Introducing Diego! He loves nature, especially animals! 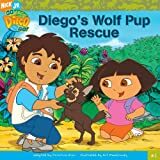 When a wolf pup gets into danger, Diego swings into action! With help from his friends and his cousin Dora, Diego finds the lost pup. But can Diego rescue him? Go, Diego, go! This book contains a page of fascinating facts about maned wolf pups. This entry was written by saurabh, posted on March 6, 2011 at 1:51 pm, filed under Ages 9-12 and tagged Action & Adventure, Animals, Hispanic & Latino, Multicultural Stories, People & Places, Simon Spotlight/Nickelodeon, Video Tie-ins. Bookmark the permalink. Follow any comments here with the RSS feed for this post. Trackbacks are closed, but you can post a comment.